Are you looking for Badgers football tickets? Ticket King is your local source for Big Ten sports. The Badgers are coming off an impressive win at Camp Randall last Saturday. Their next opponent is the Purdue Boilermakers, on the road in West Lafayette. The Boilermakers are currently 3-2, and took apart Michigan last Saturday. This will be the Boilermakers homecoming game. The Badgers will play at home on October 20. They face the Minnesota Golden Gophers that day, and the winner of the game will take home the ceremonial Paul Bunyan Axe. This will be the 122 time that the two teams have met. The historical win-loss record for this match up is currently at 58-55-8, with Minnesota in the lead. 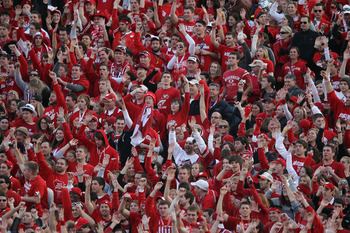 Wisconsin will stay at home for two weeks, playing the Michigan State Spartans on October 27. At the time of this post, Michigan also has a 3-2 record for 2012. They won a close game at home against Indiana, bouncing back from their one point loss to Ohio State. The Spartans look tough this year, losing to a pair of powerhouse teams in Notre Dame and the Buckeyes. The Badgers are 4-2, with losses at Nebraska and Oregon. The team took care of business against the Fighting Illini last week. Going into the fourth quarter, the game was close. The Badgers scored three touchdowns in that fourth quarter, putting the game away at the 3:26 mark. Montee Ball ran for daylight in that final drive, and had a net total of 116 yards on the day.